'Desert Frost' ( Colleen Modra, R. 2009). Seedling AB-82. AB, Oncogeliabred?. 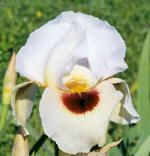 height 26" (65 cm), Midseason bloom. . Standards white, cream midribs; style arms lemon cream; Falls cream; burgundy spot; beards gold. Parentage unknown, seed from Peter McGrath.